With ubiquitous use of electronic devices where personal information is often stored, secure authentication is greatly underscored. As conventional password entry approaches are vulnerable to shoulder-surfing, gaze-based authentication approaches have been developed, but most of them require extra eye trackers which usually rely on special hardware and are too expensive for ordinary people. Aimed at both shoulder-surfing resistance and practicality, we present EyeSec, a gaze-based authentication system which exploits state-of-art gaze tracking technology without requirement for additional hardware except for a webcam. EyeSec offers three kinds of authentications, i.e., gaze-based PIN, gaze-based pattern and gaze-based captcha. 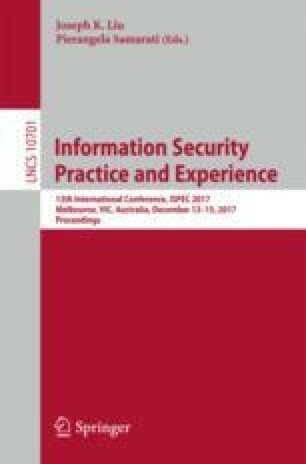 According to the results of experiment, the best-performing participants, aged between 21 and 35, achieve average \(76.2\%, \) \(90.0\%\), \(100.0\%\) success rate for passing the three kinds of authentications, respectively, which makes gaze-based authentication from theory to practice. Qianhong Wu is the corresponding author. This paper is supported by the National High Technology Research and Development Program of China (863 Program) through project 2015AA017205, the Natural Science Foundation of China through projects 61772538, 61672083 and 61370190, and by the National Cryptography Development Fund through project MMJJ20170106. This work is supported by National Natural Science Foundation of China (61472083, 61402110, 61771140).